Ofsted says improvements in Jersey are needed due to a "legacy of widespread failures". Some spells of Wednesday evening sunshine, leading into a dry and partly cloudy night with light winds. Minimum Temperature: 12 to 15C (54 to 59F). A bright start on Thursday. Thereafter, expect a mainly fine and dry day with sunny spells. Perhaps a shower late on. Maximum Temperature: 15 to 18C (59 to 64F). A hangbag was stolen from 95, Mount Durand, St Peter Port, between 21:00 and midnight on Saturday, say Guernsey Police. Inside the handbag was a Latvian Passport, Latvian ID card, Guernsey Health Card, a wallet and £30 in cash. Officers ask anyone with information to contact PC 53 Maxwell on 725111 or CrimeStoppers anonymously on 0800 555 111. The Flying Christine III took a patient from Sark to Guernsey after a call from the Sark doctor shortly after 08:00 for a medical condition. A St John Emergency Ambulance Service (SJEAS) crew of a paramedic, emergency medical technician and a trainee travelled from St Peter Port and met the Sark ambulance at Cruex Harbour. Once aboard the female patient was assessed and treated by the crew before being brought back to Guernsey. The service was supported by the marine ambulance's volunteer skipper and boat crew. The Jersey Homes Trust (JHT) has agreed to a temporary rent freeze ahead of the outcome of a review into social housing costs by the Strategic Housing Unit. It follows a recent decision by States-owned social housing provider Andium Homes to delay its annual rent rise because June’s Retail Price Index (RPI) rose to 4.5%. The increase in average earnings for the same period was 3.5%. States’ policy says that rents in the social housing sector increase at 0.75% above the RPI, which would have meant the price of leasing a home would have gone up by 5.25% on 1 October. Residential rents will be frozen for up to six months from last Saturday, 1 September. JHT is Jersey’s second largest provider of social rented accommodation with nearly 800 homes under management. Officers say the vehicle struck the pedestrian at the junction of Victoria Road and The Grange, St Peter Port, Guernsey at about 14:50. They say the man who was hit left the area and they would like him to get in touch. Police are also appealing for any witnesses to call the station on 725111 or anonymously on 0800 555 111. A major refurbishment of La Mare De Carteret High School was "long overdue" according to the school's principal Vicky Godley. The work was originally set to cost £700,000 but more money was made available by the Policy and Resources Committee after further work was identified. The refurbishment has almost finished but some work on the PE and catering facilities will be completed in the October half term. The final cost was close to £1m. Anything in terms of improvements to surroundings helps with a positive school ethos and high expectations in terms of people care. If you show you care you get the same back from the people you work with and the young people you work with." Jersey's environment department says it has been working hard to combat the invasion of Asian hornets but it needs more resources. It comes after a Jersey insect expert said one of the reasons the island lost the battle with the species is that the government didn't do enough to help. Willie Peggie, director of natural environment, says the States can't make a difference with its current budgets. He said: "It seems some of our local higher authorities don't understand the priority we could be given. It was last year or even this year before numbers got out of hand that we could have tried to exert control." The States has been asked for a comment on the level of funding provided to fight the invasive species. The introduction of a sugar tax in Jersey is due to be considered later this year by ministers after a review of the levy is carried out by civil servants. Wasp numbers in Guernsey are higher than usual following the hot summer in the British Isles, according to the Guernsey Pollinator Project. The project was launched to encourage people to provide food and habitats suitable for pollinators such as bees and wasps. The hot weather has resulted in a surplus of food for the insects, which in turn led to a successful breeding period. Just go gentle, don't start swatting and hammering it as that won't help, it will just make it more aggressive. If you kill it it gives off pheromones that attract other wasps which will just make things worse. Just give it a wide berth and it will leave. 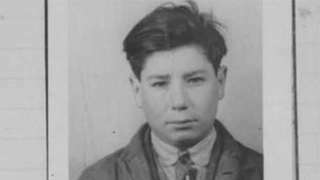 A service is held for Frank Le Villio who was deported from Jersey during World War Two. A Guernsey animal charity is warning tourists trying to spot seals "risk being bitten" if they get too close. Tourists heading to the coast to see the animals are being warned to keep their distance by the Guernsey Society for the Prevention of Cruelty to Animals (GSPCA). Steve Byrne, from the GSPCA, says some seals can be dangerous, especially if they're underfed. Video caption: Seal tourists 'risk being bitten': Pictures from Devon show seals fleeing rocks where they were resting, a vital activity when they are breeding and feeding.Seal tourists 'risk being bitten': Pictures from Devon show seals fleeing rocks where they were resting, a vital activity when they are breeding and feeding. Companies in Jersey's capital, St Helier, are paying £40,000 more to have outside seating areas than in 2013, figures reveal. A Freedom of Information request by the BBC revealed the parish made over £162,000 from companies in 2018. In August, Constable Simon Crowcroft said he would like to see more companies applying to have outside seating. He said some owners which don't have the ability to have al fresco by their cafe or business feel it is unfair, which is why they impose a charge on those that do to create a level playing field. Mr Crowcroft added: "When I took over the role of Constable of St Helier I was aware al fresco licences were not being granted but I took the decision to allow them as it is good for business and is good for town." A waste oil tank, which has been leaking into the sea at St Sampson’s Harbour, has been removed. The new coordinator of arts and culture in Jersey says he's been getting better support from the States since the election in May. ArtHouse Jersey sees the Jersey Arts Trust, the Arts Centre and the Opera House brought together under one banner. New executive producer, Matt Fiott says he plans to try to improve funding and support for the arts in the island. ArtHouse Jersey wrote to all of the island's election candidates in May claiming there was a crisis in the arts sector. Video caption: Jersey arts boss says he's getting better support from the states.Jersey arts boss says he's getting better support from the states. Almost 27 years after it left the airwaves, a radio station which broadcast to Jersey from the attic of a restaurant in Normandy was due to relaunch this morning online. Machinery that will be used to process waste at the new transfer station has been installed at Longue Hougue. Guernsey is not facing the teacher shortage that is currently hitting the UK, according to the president of the island's Education, Sport and Culture Committee. The UK Education Secretary has promised to cut teachers' workloads in a bid to tackle the shortage, but in Guernsey the committee says the staffing situation is "looking healthy". Deputy Matt Fallaize said there are some challenges as most secondary school teachers are recruited from off island but they have had a successful round of recruitment this year. He said: "At secondary level there are a lot of differences. Most teachers will be recruited from comprehensive systems but we are running a selective system and our schools are smaller than the average size in the UK." Jersey is world-renowned for its cows and their dairy produce but 2019 could be the Island’s Year of the Goat, as a new venture aims to put their organic milk and goat’s cheese on the shelves next year.